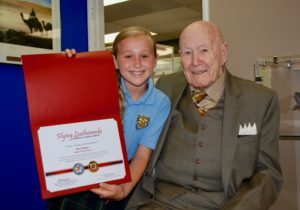 The Board of Directors and staff of the Flying Leatherneck Historical Foundation, the docent team of the Flying Leatherneck Aviation Museum and the staff of the Character Education Resource Center of the University of San Diego are pleased to announce the winners of the Fall 2017 essay contest. FIRST PLACE: Three Words. One Goal. by Emily Salazar from St. Gregory the Great School, San Diego, CA and submitted by teacher David Buckley. SECOND PLACE: A Battle Worth Fighting by Logan Morris from Muirlands Middle School, La Jolla, CA and submitted by teacher Stephanie Marsala. THIRD PLACE: When No One is Looking by Callahan Armstrong from Muirlands Middle School, La Jolla, CA and submitted by teacher Nicole Ervin-Fugiel. FIRST PLACE: Honor, Courage and Commitment by Trevor Tishenkel from Poway High School, Poway, CA and submitted by teacher Karen Kawasaki-Williams. SECOND PLACE: Mom by Jovan Kirovski from Poway High School, Poway CA and submitted by teacher, Karen Kawasaki-Williams. THIRD PLACE: The Future is in Our Hands by Athena Amantidis from Scripps Ranch High School, San Diego, CA and submitted by teacher Ferdinand Toledo. The Flying Leatherneck Historical Foundation gratefully acknowledges the financial support of its education program, provided by San Diego Gas and Electric (SDG&E) and Major Glenn Ferguson (USMC-retired).